A "slash chord" is a hybrid kind of chord. It simply means "play the given chord OVER the note after the slash." 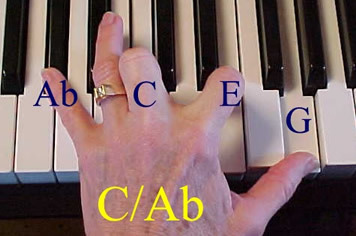 In other words, in this example, we would have a C chord played, but the lowest note would be Ab (which of course is not in the C chord). What's usually going on are "passing tones" that comprise a type of counter melody. I realize this is a hard concept to grasp in the abstract, but listen to the audio that goes with this lesson, and I think you'll begin to understand. Cm7/Bb F6/C G9/F Eb13/Ab A7/G Etc, etc. Try all those on for size. Just remember that the letter to the left tells what chord it is, and the letter after the "slash" tells what the lowest note of the chord should be. And that's all you need to know about that!